The other day I was surprised to hear from a long-lost friend that she’d given birth to her third child. I never would have taken her for a mother in the first place. When I told my husband about my old friend, much to my surprise he suggested that we have a second child. I find myself astonished that he wants a second child and seems to have kept his mouth shut due to my own opinion on the matter. And now I’m confused, particularly as there is a lot of social pressure to have more than one child in France…likely due to the amazing programs available to help you care for them. On the one hand, despite my flawed relationship with my own siblings, I’m grateful they exist and feel bad that my son will not have this ‘record’ of his early life at home, or camaraderie on holidays or later in life, particularly as my husband and I will likely be dead by the time he has his own family. Moreover, I’ve bought into the stigma around only children as lonely, indulged, and neurotic creatures. On the other hand, the single children I know tend to be rather independent and strong-willed, traits I admire. And, also, there are too many people in this world already. I didn’t have a maternal instinct until I had my own child. In fact, I was skeptical of the whole motherhood route for a variety of reasons. I also had a very problematic pregnancy, and am not too keen to repeat the experience. If I were to try to get pregnant again, and to have a child, I would be doing it for my child and my husband only…I don’t want to be selfish, however, so I started talking to friends here in Chamonix and abroad, and doing a bit of research on the subject. My friends in Chamonix told me that if there is even a seed of doubt in my mind, and if there is any chance that if the circumstances were different and I COULD have a baby in five years, once I’ve rested from the previous pregnancies, then I SHOULD try to have another baby now and just ‘grin and bear it.’ Two of these friends were only children themselves, and they went on to have three kids precisely because they were only children. Two other friends who were only children told me that they never knew any differently while growing up. Reassuring, except that they have two kids each. She writes: A friend of mine recently sat down with me and asked me in all seriousness whether I was happy about being an only child. It was if she were asking me what it was like to cope with a disability. But she had an agenda. She has got an only child and she is concerned that if she doesn’t have another one, her currently happy and well balanced three year old is somehow going to mutate into a gorgon of bitterness and despair. My experience of being an only child has been unequivocally positive, and I was happy to put my friend’s mind at rest. Sometimes I wonder what it would be like to have a sibling, of course, but rather than wondering what he or she would have been like, I find myself wondering if I would have turned out to be a fundamentally different person. There is no way of knowing. But there are several things I know about myself and I am convinced they stem directly from being an only child. First, I love my friends beyond words. I have a huge circle of acquaintances, I am an incredibly social beast, but there are a handful of people to whom I am devoted to the point of madness…. Second, because I grew up with no experience of sibling rivalry, I have no professional jealousy. I have never, not once, looked at one of my peers and begrudged them their success…The only negative I can ever come up with when I am quizzed about the downside of being an only child is that, when the time comes, I shall bear the burden of my parents’ old age and inevitable decline on my own. While this will be difficult and stressful and heartbreaking, I can think of no greater privilege than being asked to look after the two people to whom I owe everything… I like being an only child. I am guessing that other only children like being the way they are, too. So, please, stop treating us as if we are birds with broken wings…There is a reason China is now the most successful country in the world. It is because it is run by an entire generation of only children. Coincidence? I think not. Let the world take note. 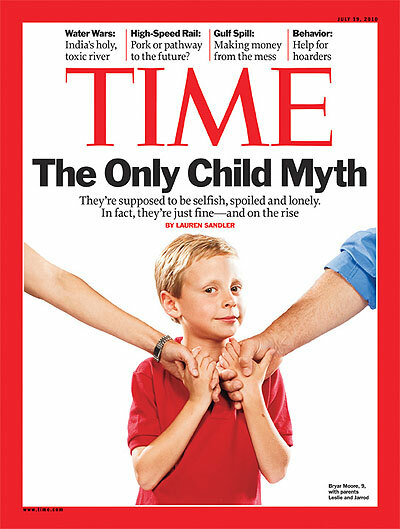 In a review of 141 studies examining the personality traits associated with only children, the spoiled, selfish, lonely stereotype had no basis in fact. Only children also rate significantly higher in achievement and motivation, due to increased parental scrutiny. Studies also indicate that only children score higher in adjusting to new environments, exerting self-control, and interpersonal skills – all skills I hold dear. But, it was my mother who both made me laugh and made me realize that for-better-or for-worse, my dear boy will be an only child; she told me that my siblings and me always wanted to be only children. Indeed. So, I will pull up my socks, get on with life as I have it, and simply love my single, and certainly singular, child.